The Somfy Home Alarm is only wireless alarm system that chases intruders away before they’ve even entered the premises. Compatible with: Amazon Alexa - Works With Nest - IFTTT. With this comprehensive wireless alarm system, you can protect every nook and cranny in your house, the motion detector and the three door and window sensors that come as standard immediately send a push message to your smartphone if there is a burglary. A loud siren goes off at the same time. The IntelliTAG™ is the only door and window sensor that warns you if there is an attempted break-in BEFORE the intruders break in. In the process, it can recognise the difference between a ball bumping the door and the door being forced open. And what about your pets? With the smart motion detector, animals up to 25 kg can romp around and run past the camera without setting off the alarm. For convenience, you get two key fobs that you can use to switch the alarm on and off. Even better, as soon as you get close to your house, the system ‘sees’ that you’re standing in front of the door and is automatically switched off. Which is really useful if you happen to have your hands full. The Somfy Home Alarm can be expanded to include various handy accessories, such as cameras and sensors, for instance. 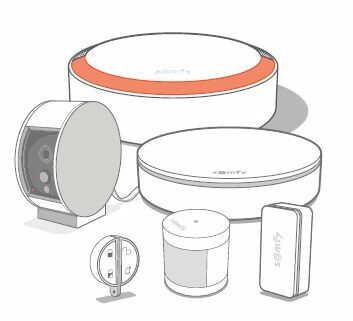 The heart of your Somfy security system, it connects to your Internet through Wi-Fi and links all the elements wirelessly. Smart wireless door and windows sensor, it sets a security perimeter around your house and detects intrusion attempts. Personal remote control that automatically disarms your system when you get back home. Wireless, it sounds at 110db when an attempted break-in is detected. Set it up anywhere, it adapts to your interior design. Small, discreet and wireless, it detects all human movements while remaining indifferent to pets. Wireless, it can be placed either outside of your home. When an attempted break-in is detected, it sounds at 112dB. The only smart home security camera with a motorized shutter that protects your home AND privacy. Increases your Link's radio range; extends radio coverage between all Somfy Protect system devices and guarantees reliable, high-level security.